Want to download your Fitbit data? Download Your Fitbit Data: Are you using a Fitbit to monitor you exertions on the squash court? If so then you will probably want to download your Fitbit data to get a deeper understanding of how you perform. Using a Fitbit is a great way to check your basic exercise stats., such as how many steps you have taken, how far you have walked/run, etc. 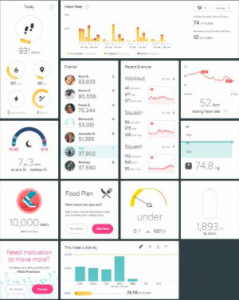 (see example of a Fitbit Dashboard below). Using the heart rate monitor allows you to track your heart rate through a game, and correlate your performance with how your heart rate varies during the match. As a Fitbit users you are allowed to download your Fitbit data using in-built functionality on the Fitbit website, but if you want more flexibility, and want to access the intra-day data for heart rate, for example, you need something more. So, I have built this feature into the SquashLeagues website. Currently as a Fitbit user you can download your Fitbit data using the interface on this site (which uses the official Fitbit API). You can access your Activity data and Heart Rate data – both Time Series data as well as Intraday data. I am gradually extending the scope of data that can be accessed and I will add the ability to access more and more data over time. Before being granted access to the data, however, users must register on the SquashLegaues website – one of the security restrictions imposed by Fitbit themselves. You can register here. In order to download your Fitbit data, you have to be logged in to your Fitbit account and you must also grant permission for this application to access your data. This complex security checking is all handled for you within the SquashLeagues.org website, so it’s very easy to do – but equally very secure. You are able to select what data you wish to have (Heart Rate Data, Activity Data or Sleep Data), and you can also select any date range. If you select a single day, then you can access the Intraday data referred to above. Selecting a date range of more than one day retrieves daily data. After completing the selection form your data will be displayed and you will be given the option of downloading it. Try it out for yourself here and download your Fitbit Data. N.B. If you don’t see what you are looking for, in terms of the type of data you are trying to access/download, then please check back regularly, as I will be regularly enhancing the site with extensions to the scope of data accessible. This entry was posted in Fitbit, General and tagged Fitbit, fitness. Bookmark the permalink. 3 Responses to Want to download your Fitbit data? Wow! Thank you so much for making this application available to all! Must have been quite a “bit” of work. As an old pickleball player who just developed Afib, I’ve become quite interested in tracking my heart rate in finer time detail than the 5 minute increments FitBit allows… AND being able to download and graph it as well. Thanks for your reply to my blog post. I have to say I am filled with admiration for your determination – to run a full marathon at age 80 is a truly laudable goal! I wish you all the best with your endeavor. Regarding downloading your fitbit data, my website uses the ‘standard API’, or interface, to the fitbit data source, and fitbit themselves impose some limits on the amount of times this can be called within a specific period. I never thought that the site would be so popular that this limit would be reached, but apparently it has now reached this stage. I am working on finding a way to get more efficient use of the interface, but in the meantime, I’m afraid that you may receive this error message in times of high usage. Don’t worry if you receive theerror message – just give your downloading a break for a while and try again later.